WE TRY HARD TO MATCH or BEAT CHINA PRICES pleasemail. Motor(at)fastmail(dot)fm. Gloss black detachable backrest (ships for free in the USA). See other listings for rack. I only have these docking kits available 53932-03a , 53930-03(a) , 53959-06 please check other auctions. Fits 2000 to 2017 softails (not heritage classic / not springer heritage see other auctions) not 2006 big rear tire softail , please see other auctions. 2005 to 2017 softail deluxe. 2005 to 2007 Softail Springer Classic. 2006 fat boy (not 2006 screaming eagle fat boy). 2005 fat boy , softail standard , night train , springer softail. 2004 fat boy , softail standard , night train , springer. 2003 fat boy , softail standard , night train , springer. 2002 fatboy , softail standard , night train , springer. 2001 fat boy , softail standard , night train , springer. 2000 fat boy , softail standard , night train , springer. Mini medallion Low upright 51851-09. Smooth Pad w/ small little chrome bracket 52626-04. 4 small bolts to hold lower bracket plates to upright. 3 small bolts that hold the pad on. Milelers (AT) fastmail (DOT) fm. Over seas / canada is ok u. Softail Deluxe FLSTN CVO Softail Deluxe FLSTNSE. NO Custom Vehicle Operations Fat Boy FLSTFSE CVO. Fat Boy FLSTF Fat Boy EFI FLSTFI Heritage Softail EFI FLSTI Softail Deluxe FLSTN Softail Deluxe EFI FLSTNI Softail Springer Classic FLSTSC Softail Springer Classic EFI FLSTSCI. Fat Boy FLSTF Fat Boy EFI FLSTFI Custom Vehicle Operations Fat Boy FLSTFSE Softail Deluxe FLSTN Softail Deluxe EFI FLSTNI Softail Springer Classic FLSTSC Softail Springer Classic EFI FLSTSCI Softail Standard FXST Night Train FXSTB Night Train EFI FXSTBI Softail Standard EFI FXSTI Springer Softail FXSTS Springer Softail EFI FXSTSI. Fat Boy FLSTF Fat Boy EFI FLSTFI Softail Standard FXST Night Train FXSTB Night Train EFI FXSTBI Softail Standard EFI FXSTI Springer Softail FXSTS Springer Softail EFI FXSTSI. Fat Boy FLSTF Softail Standard FXST Night Train FXSTB Springer Softail FXSTS. THIS ITEM WILL NOT WORK ON HERITAGE flstc OR SPRINGER HERITAGE flsts. BECAUSE OF OEM LARGE MOUNT SADDLEBAGS. YOU NEED 53815-00 I HAVE THESE PLEASE ASK QUESTION. 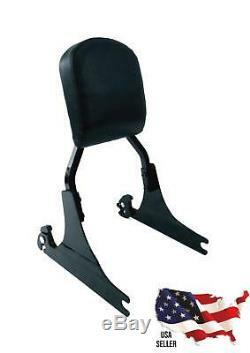 The item "BLACK harley fatboy detachable backrest sissy bar softail fat boy FLSTF 2000-06" is in sale since Tuesday, November 7, 2017. This item is in the category "eBay Motors\Parts & Accessories\Motorcycle Parts\Seats & Seat Parts\Backrests & Sissy Bars". The seller is "wrogr" and is located in Maumee, Ohio. This item can be shipped worldwide.